This will be a testing week for anyone who fears clowns, Dr Mumbo suspects. 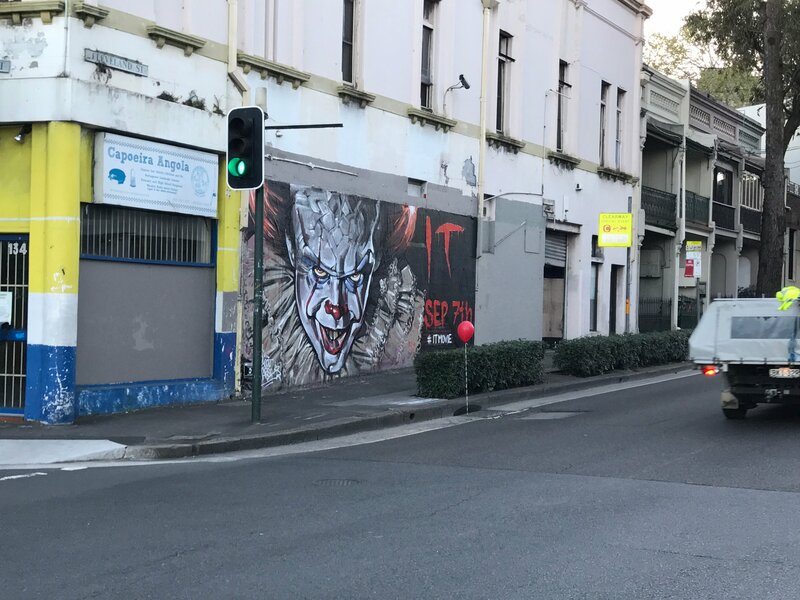 For sufferers of coulrophobia, Thursday’s release of the Village Roadshow Films distributed movie IT will make it a marketing blitz to remember. Dr Mumbo had already been impressed by the impact of hand-painted billboards for IT, featuring supernatural monster Pennywise the Clown. But today saw the most iconic image from the Stephen King novel brought to life: a red balloon emerging from the drain. A team of guerrilla marketers clearly got out of bed early this morning. 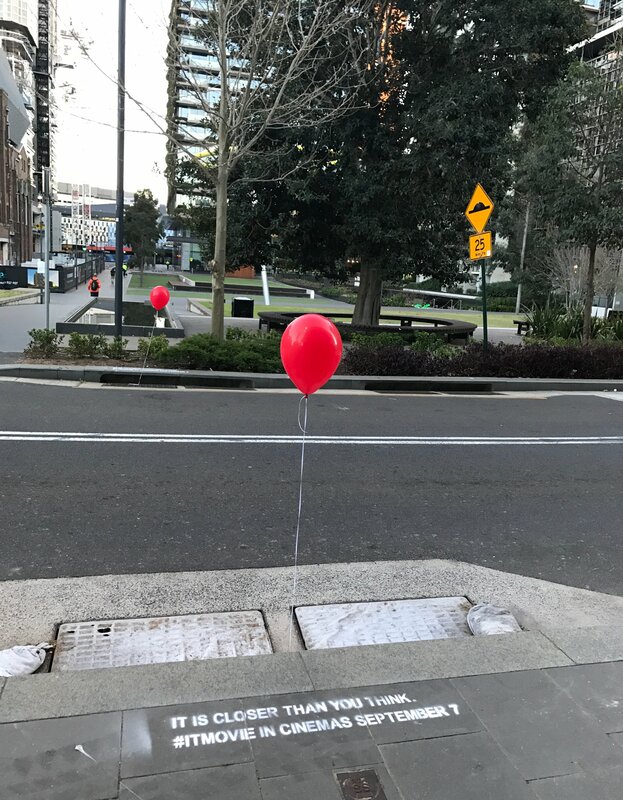 By breakfast time near Dr Mumbo’s office – and presumably in CBDs across the country – the drains have red balloons floating in front of them. Dr Mumbo suspects that few media budgets will be invested more (penny)wisely than purchasing a few red helium balloons and a stencil. He can only keep his fingers crossed that they don’t now go and spoil it all by organising a clown flash mob. Thanks for the great write up. I’m the marketing Manager at Village Roadshow behind this campaign, happy to share with you details of the campaign. Please email any questions. Because balloons… they all float down there. I have a question – did anyone in your team flag the environmental concerns resulting from this campaign? It’s littering. I have a fear of clowns. Especially those in marketing. Well played Stacie. So well played. Love it. Stacie, well done. Saw this around Martin Place – in front of the crossing on Pitt st in on the sewer grate in front of the GPO building … thought it was the member of the public having a joke, had a bit of a chuckle -This is pure genius! Know me? You’ve never seen anything like me. I am the Alpha of Alphas. I am the apex of apex predators! I am Death, destroyer of worlds! I am the Demon-Wolf! how dare you not submit my comment. DO YOU KNOW WHO I AM? DO YOU!? Great piece of marketing, orginal, simple and contenxtual! Well done Stacie. A great bit of marketing. You couldn’t have got a better artist to do the job. My only addition would’ve been some little kids in yellow raincoats each holding a paper boat (supervised, of course). Hey guys, here’s a 7 part series of the clown murals including interviews with each artist!